We have some exciting charity news! We’ve just joined Care and Fair (details to follow). We’ve also committed to building a playground for children of weavers in Northern India. The playground will be at a school that Care and Fair operates for the children of weavers. Education is of tremendous importance, but so is play! In addition to what equipment Care and Fair suggested, our 11 year old daughter had some input. Apparently no playground is complete without a tire swing. So, they will have one. The playground will contain a slide, a merry go round , a cricket field, a see saw, a jungle gym, swings, a basket ball hoop, and the tire swing. Once this project is completed we will embark on another. We believe in giving back. 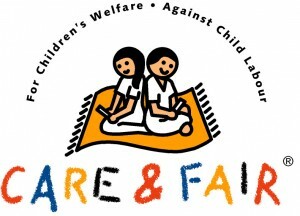 Care and fair is an organization devoted to the health and education of families in rug producing areas. • Create better living conditions for and offer training possibilities to carpet knotters and their families in the carpet industries of the countries of origin through education and primary health care. • Make clear to manufacturers through co-operation and partnership that western buyers will no longer be willing to accept products originating from child labor or other socially unacceptable production. • Be an example within the industry and trade on social responsibility. To date, over 450 member companies worldwide have committed themselves to these goals. Care and Fair builds health clinics to serve the families of weavers. Doctors visit all the schools on a monthly basis to examine each of the children. Small ailments are cared for immediately and more significant cases are sent to clinics equipped to address them. Inoculations are also provided. Children are even provided solar powered lamps so that they can study at night without using dangerous oil lamps. Women empowerment programs serve to educate grown women and teach them crafts which they then can sell. We look forward to providing you updates as well as pictures of the completed playground.